YANGON–Hundreds of political prisoners have been released from Myanmar’s jails in amnesties in recent years, including dozens freed in January 2016, days before democracy champion Aung San Suu Kyi’s party took power for the first time. Former President Barack Obama announced the lifting of U.S. sanctions in October 2016, citing the release of political prisoners and improved human rights as well as the elections that brought Suu Kyi to power. Suu Kyi herself had been under house arrest for 15 years before being released in 2010. Prison reform, however, has been put on the back burner under the new government. A new prison law was discussed in parliament in 2015, but was not passed. It has not been taken up since then by a new set of lawmakers – most of them from Suu Kyi’s National League for Democracy (NLD) – who took their seats in early 2016. The Assistance Association for Political Prisoners (AAPP), a Myanmar group formed by former detainees, says prison reform should include repealing a law that gives police broad powers of arrest and pre-trial detention. The AAPP advocates overhauling vague or outdated rules in the Jail Manual and Penal Code, much of it written during British colonial rule. But the AAPP and rights groups caution that any new legislation on prison reform would not stop politically motivated prosecutions, which would need to be addressed with specific judicial and legal reforms. Suu Kyi’s government pardoned, released or dropped charges against hundreds of political prisoners in the month after it took office. But today, 46 people are serving prison sentences for political activities, and another 52 political prisoners are in jail awaiting trial, the AAPP says. NLD Party spokesman Aung Shin told Reuters prison reform was not yet on the legislative agenda because of other priorities. “There are so many things to do as MPs, it may be a part of the reasons for not including prison reform in the parliament discussions,” Aung Shin said. He also said, however, prisons should be part of a broader examination of legal and judicial reform that the party and legislature was planning. He did not give a time frame for any contemplated legislation. AAPP says that 120 former political prisoners from the NLD party are members of the national parliament or regional assemblies. The military did not respond to requests for comment. The home affairs ministry says it has improved prison conditions across the country. A ministry report in March said the Correctional Department had relaxed rules on family visits and improved education programs. Many of the political prisoners, including some today, were jailed in Insein, a 19th-century prison in the north of Yangon that had a notorious reputation for torture, hunger strikes and rioting over inhumane conditions until Myanmar began transitioning to civilian rule in 2011. 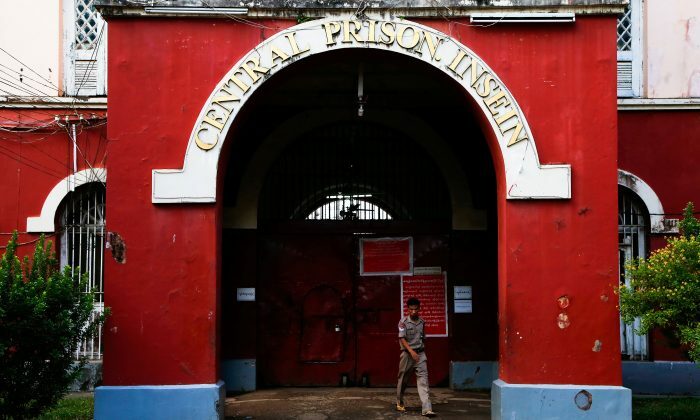 For decades, Insein prison, which has held politicians and poets alongside murderers, thieves and drug dealers, was emblematic of oppressive junta rule and Myanmar’s poor record when it came to the rule of law. Some prisoners were kept isolated or were physically and mentally abused while in jail, former inmates say. Amnesty International said misbehaving prisoners, including political prisoners on hunger strike, were still kept shackled in filth in kennels meant for dogs as recently as 2011. Suu Kyi herself was briefly held in a hut in the prison compound between spells of house arrest. Leaders of the NLD spent time there before Myanmar’s military rulers started a transition to democracy in 2011 that brought both the release of hundreds of political prisoners and an improvement to prison conditions. Insein is where Reuters journalists Wa Lone, 31, and Kyaw Soe Oo, 27 have been detained as they face an investigation into whether they breached Myanmar’s Official Secrets Act after the two were detained on Dec. 12. Built during British colonial rule in the 19th century, Insein covers about 200,000 square meters – larger than New York’s Grand Central station. By some accounts, conditions there have gotten a lot better. Kyaw Zwa Naing, detained in Insein for two weeks in June after writing a satirical article mocking the military, said “the prison officers treated us well”. “We could access food supply without limitation. No one threatened us,” he said. After an inspection in March, the government-backed Myanmar National Human Rights Commission identified overcrowding as a problem and recommended building new dormitories. “The unlucky ones have to sleep right next to the toilet. In Myanmar, we can’t provide international standard cells for inmates,” Commissioner Yu Lwin Aung told Reuters. Political prisoners and those accused of other non-violent offences are housed with inmates both accused and convicted of violent crimes, according to the AAPP, which regularly interviews recent inmates. Family members say the Reuters reporters each have their own cell and sleep on mats on raised platforms. However, they say the two are fearful because they are being held in the same block as both suspected and convicted criminals. Min Tun Soe, a deputy director and spokesperson for the Prison Department said overcrowding was no longer a concern – the prison now houses 12,000 inmates after increasing its capacity to 10,000. “There’s lots of reform going on in the prisons, such as new budgets for food supplies, healthcare and education opportunities for inmates, and also reforming the moral behavior of inmates,” he said. “The situation is different than it was before,” he said.